In 1995, an international group of scientists, academicians, and medical practitioners with expertise in vegetarian nutrition was identified to assist in the process of developing a de novo vegetarian food guide with a graphic. Emphasis was placed on selecting individuals who would represent diverse vegetarian traditions and practices. Those organizing the alliance were involved with program planning for the Third International Congress on Vegetarian Nutrition, scheduled in 1997.35 At the two previous meetings of the International Congress on Vegetarian Nutrition in 1992 and 1987, there were numerous requests for tools to use in the nutritional guidance of vegetarians. Most health practitioners were using a vegetarian-adapted USDA food guide pyramid sans meat, published by the General Conference Nutrition Council (GCNC) of Seventh-Day Adventists.25 This pyramid has been and continues to be useful for a large number of lacto-ovo-vegetarians, but it fails to address frequency and the full continuum of vegetarian philosophy related to the degree of excluding animal products from the diet. 1. When proper guidelines are applied, vegetarian diets promote adequate growth and development, and meet the nutritional needs of healthy individuals throughout the life cycle. 2. Evidence-based research on the dietary patterns of vegetarian populations had been observed and described and the data were available in the scientific literature. 3. Epidemiological data on vegetarians in Western countries over the last 4 decades had documented lower risk for most chronic diseases, increased longevity, lower body weight, lower blood pressure, and improved overall health status of vegetarians. A diverse international alliance of people with expertise in vegetarian nutrition was identified. Next, each member received a letter of invitation and a Questionnaire to Aid in the Development of a Vegetarian Food Guide (Figure 16.1). Based on the initial responses, a draft of the food guide supporting script and possible graphic illustration formats were shared with the contributors. The group eventually met in person to discuss the issues and select a graphic format in a consensus-building process. Instructions: Please fill out the following questionnaire by answering both the yes/no questions and also responding to the open-ended questions. Should you need additional space, include additional pages. 1. The following are several possible applications of a vegetarian food guide. Which one(s) are the most important? When in conflict, which one(s) should prevail? A. Develop a food guide for the person wanting to become a vegetarian. B. Develop an "ideal" vegetarian food guide. 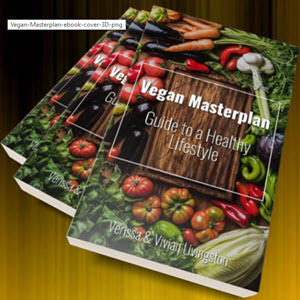 C. Develop a guide that is flexible and applicable to a range of vegetarian practices. D. Develop a vegetarian food guide to aid in the prevention of chronic disease. E. Develop a vegetarian food guide that meets the requirements of the RDA's. (Western societies) or also to developing countries? 3. What criteria would you recommend to define a food grouping (i.e., common nutrients, botanical classification, cultural preferences, etc.)? 4. What foods should be included in a vegetarian food guide? 5. What foods, if any, should be excluded from a vegetarian food guide? 6. What foods would you define as a separate grouping in a vegetarian food guide? 7. In developing a new vegetarian food guide, how should the RDAs be used to guide the process? For example, should the lowest RDA for calcium be used or the highest RDA level for calcium be used? Or maybe ignore the RDA and use more recent research? 8. In designing a vegetarian food guide, how should epidemiological data be used? How should nutrition studies be used? Which has greater weight? For example, researchers have identified groups of people who are at very low risk of chronic disease, however, diets of these groups may fail to meet the RDA standards in certain nutrient categories. 9. Should the vegetarian food guide be flexible in its design, including guidelines for total vegetarians, lacto-ovo-vegetarians, and other modifications, or should this committee focus on one vegetarian philosophy? 10. Should a point system be used to designate nutrient-dense foods? 11. What graphic format would be best utilized in developing a vegetarian food guide? Figure 16.1 Questionnaire to Aid in the Development of a Vegetarian Food Guide. principles represent the basis for food selection and meal planning for diverse vegetarian populations. The following is a summary of these concepts and the underlying rationale for their selection. • Consume a variety and abundance of plant foods. • Primarily consume unrefined, minimally processed plant foods. • Consumption of dairy products and/or eggs is optional. 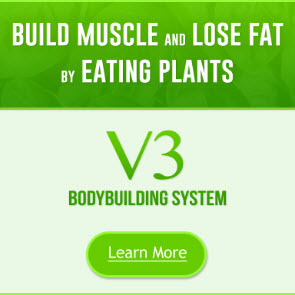 • Consuming a wide range of fat from plants is compatible with health. • Consume a generous amount of water and other fluids. 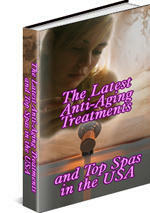 • Pay attention to other healthy life-style factors protective plant foods. Plant foods include: whole grains (e.g., wheat, rice, oats, barley, gluten- and grain-based products and beverages), legumes (e.g., peas, lentils, beans, soy-based products and soy beverages), vegetables, fruits, nuts, seeds, plant oils, sweeteners, herbs, and spices. In principle, the daily consumption of a variety of foods from all of the plant groups, in quantities to meet energy needs, can provide all of the nutrients needed by humans except for vitamins B12 and D. Diets providing ample plant foods are low in total and saturated fat, and are high in fiber, folate, antioxidant nutrients, and phytochemicals. Consumption of a variety of plants contributes thousands of substances that are protective, many of which continue to be described and quantified. The second principle, "primarily consume unrefined, minimally processed plant foods," highlights consumption of plant foods that contain more vitamins, minerals, and dietary fiber than their refined and highly processed counterparts. Although most vegetables, fruits, nuts, and legumes can be consumed with minimal refinement, this is not the case for foods derived from grains. Regular consumption of whole grains is associated with a lower risk of heart disease, some cancers, and diabetes. However, the food industry has reaped massive profits from refining grains to the point where many grain products must be fortified to replace some of the nutrients lost to processing. This aspect of food processing has robbed the consumer of achieving optimal nutrition by removing beneficial substances and, oftentimes, in addition to mandated fortification practices, adding back other less-than-desirable chemicals. However, not all aspects of food processing are deleterious. Food processing may play an important role in the enrichment of plant-based foods with vitamin B12, calcium, vitamin D, and other nutrients. Plant-based food products enriched with specific nutrients may be nutritionally valuable adjuncts to a vegetarian diet. This aspect of food processing should be evaluated for long-term benefits among vegetarians. In general, a diet based on unrefined and minimally processed food is more likely to supply the optimal balance of protective substances needed to promote health and prevent disease. The third principle, "consumption of dairy products and/or eggs is optionalrecognizes that some vegetarians (i.e., vegans) opt to limit dairy products and eggs. The consumption of dairy products and eggs is not necessary to achieve RDAs, but is often practiced for convenience and practicality. Quantitatively, consumption of dairy products and eggs by vegetarians varies from infrequent to daily. Vegetarian diets that include dairy products, eggs, or both (i.e., lacto-ovo-vegetarian diets), easily provide all the nutrients required by healthy adults. In population studies, such diets have been shown to be healthful and promote longevity, with no need for routine nutrient supplementation. Because some dairy products are high in fat and saturated fat, it is preferable to emphasize nonfat and low-fat options. Consumption of eggs should be evaluated on an individual basis relative to health and economic status. Vegans represent a sub-group of vegetarians who rely completely on plants to meet all their nutrient needs. This dietary pattern requires due diligence to several nutrients that may be inadequately consumed: vitamin B12, vitamin D, calcium, and linolenic acid. This is particularly important for vulnerable groups such as growing children, pregnant or lactating women, and older adults. The requirement for protein is easily met by vegans' consuming adequate amounts of plants such as legumes, lentils, peas, whole grains, nuts, and seeds. However, there is potential for inadequate protein intake when overall kilocalorie needs are not met. Long-term inadequate consumption of protein may lead to muscle wasting or extreme thinness, disturbances in GI function, and immune or neurological dysfunction. Vitamin B12 is the only vitamin not found in the plant kingdom. It was isolated in 1948 and synthesized in 1963. This made it possible to consume a vegan diet that included vitamin B12 either in pill form (oral or sublingual), added in processing to other plant foods, or as an injection prescribed by a physician. All vegans need to identify a regular and reliable source of vitamin B12, either as a supplement or a fortified plant-based food. Vegans also need to plan for obtaining vitamin D, whether by regular exposure to sunlight or regular consumption of vitamin D-fortified plant-based foods. In the U.S., the principal dietary source of vitamin D is fortified cow's milk. Diets that exclude cow's milk may require a supplemental source of vitamin D. A non-food source of this vitamin is daily exposure of unprotected skin to sunlight. Inadequate exposure to sunlight is more likely to occur in northern latitudes and during the winter months. Those with inadequate exposure to sunlight and inadequate dietary intake of cow's milk should be advised to consume vitamin D-fortifi ed plant foods such as breakfast cereals, soy- or grain-based beverages, energy bars, candy, and a variety of other foods. Historically, those eliminating dairy products have had greater difficult meeting the calcium RDA. However, in addition to almonds and leafy green vegetables, options for consuming plant-based sources of calcium have expanded to include calcium-fortified products such as soy and grain beverages, orange juice, energy bars, candy, bread, and calcium-precipitated tofu. New food products containing significant amounts of calcium will continue to become available, allowing for convenient consumption of calcium. In addition to fortified food producs, a wide array of calcium supplements may offer reliable sources of calcium for vegetarians. Linolenic acid is an essential fatty acid, primarily found in the following plant foods: flax seed, walnuts, soybeans, soybean oil, tofu, and canola oil. It is also found in minute amounts in green leafy vegetables and wheat germ. Vegans should plan for regular and adequate consumption of linolenic acid. The fourth principle, " consuming a wide range of fat from plants is compatible with health," refers to the many highly diverse vegetarian dietary patterns that have been described in the scientific literature. Significant sources of plant fats include nuts, nut butters, seeds, avocados, olives, soy, coconut, and plant oils. Vegetarian diets are frequently equated with low-fat cardiac diets and various therapeutic diets. Very low-fat vegetarian diets (i.e., 10-15% energy from fat) have proven helpful in therapeutic approaches to disease management. In general, vegetarian dietary patterns contain less saturated fat, cholesterol, and trans fatty acids. The fat content of vegetarian dietary patterns may represent an additional philosophical difference among vegetarians. The fat content of both lacto-ovo and vegan dietary patterns can vary widely from a very low fat content (<20% energy from fat) to a mid range of fat content (20 to 30% energy from fat) to a higher range of fat content (>30% energy from fat). The vegetable oils food group was designated as optional to provide for the maximal adjustment of fat intake (see Figure 16.2). Placement of the vegetable oils food group could have been either below or above the optional line. However, vegans frequently prefer to consume primarily "whole" plant fats and tend to avoid highly processed forms of fat. Most vegetable oils are processed to some degree. Olive and nut oils are pressed and therefore not as processed as other vegetable oils. Those consuming foods from the core plant food groups will primarily consume intact plant fats such as nuts, seeds, avocado, olives, coconut, and soybeans. Figure 16.2 Loma Linda University Food Guide Pyramid. should apply to vegetarians whose dietary fat consumption is primarily from unrefined plant fats. Among vegetarian populations, it appears that when energy intake is balanced with energy output, a whole range of fat intake, primarily from plant fats, is compatible with excellent health. Fluid intake among vegetarian populations is higher when compared with the general population. The fifth principle, "consume a generous amount of water and other fluids," refers to the consumption of water, freshly prepared fruit and vegetable juices, and green and herbal teas. Green tea may represent an additional dietary source of antioxidants and phytochemicals in the diet not specifically mentioned in any of the plant food groups. Green tea, the least processed of all teas, has been consumed by plant-based Asian populations for nearly 5,000 years. Green tea provides a generous array of many antioxidants, including the flavonoids. Published reports suggest that the tradition of regularly consuming green tea may prevent or delay formation of tumors and reduce the risk of heart disease and stroke.44-48 In summary, a generous intake of water and a variety of other fluids represents another characteristic of a healthy vegetarian dietary pattern. 1. Most scientific data supporting the health benefits of vegetarian diets are from vegetarian populations that do not consume alcohol. 2. There is no evidence that adding alcohol to the diet of a low-risk vegetarian population will further lower the overall risk of chronic diseases. The sixth principle, "pay attention to other healthy life-style factors," refers to healthy life-style practices seen among many vegetarians such as regular physical activity, frequent exposure to sunlight and fresh air, adequate rest, limiting prolonged exposure to stress, and avoidance of harmful practices such as smoking and excessive alcohol consumption. Diet is one of several behavioral factors that influence health status; other life-style factors should be addressed as well in the context of optimizing nutrition guidance and obtaining positive health outcomes. The pyramid shape was chosen for its familiarity, flexibility, and current usage among consumers. Next, the principles of healthy vegetarian diets were used to guide identification and placement of the food groups. Beginning with the bottom of the pyramid, food groups were arranged in tiers based on ascending relative importance, proportionality, and frequency, and in such a way as to encompass the two most common vegetarian traditions: lacto-ovo and vegan. The food guide depicts nine food groups: whole grains, legumes, vegetables, fruits, nuts and seeds, vegetable oils, dairy, eggs, and sweets. The five major plant-based food groups (whole grains, legumes, vegetables, fruits, and nuts and seeds) form the vegan trapezoid. 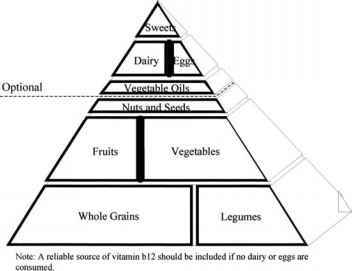 This lower portion of the pyramid illustrates the core plant food groups which, when consumed in adequate amounts, constitute the backbone of any healthy vegetarian dietary pattern (Figure 16.3). Some vegetarians will primarily use the trapezoid section for dietary guidance.